Before you get started, you’ll need to make a big decision: white lights or colored lights. If you ask around, you’ll probably find that people have very firm opinions about which is better. Of course, it all depends on your personal style. For those who favor minimalist designs, white lights are the way to go. The soft glow of white lights creates a truly magical look and definitely creates a winter wonderland vibe. White lights are simple, classic, and elegant. On the other side of the coin, we have those who love to bring colored lights into their holiday decor. Multicolored lights offer up a festive and fun look that instantly puts you in the holiday spirit. With colorful lights, you have a ton of design options, too. For a more traditional look, you can go with the classic rainbow style strings of red, yellow, green, and blue. If you want a more unique design, try pairing red and white together for a candy cane inspired display. Or, you can pick strands of all one color for something a little different. The possibilities are endless! Not everyone is into having the flashiest house on the block, with elaborate displays featuring tons of accessories. If you want to be festive but not over the top, go with a classic outline design. 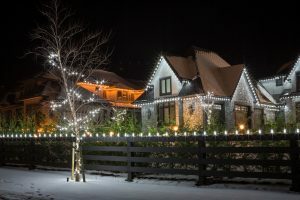 Simply string lights along the roof, gutters, windows, and doors—this is a great way to show off the architectural elements of your home for the season. For the most minimal version of this look, you can simply go with the roof line on its own. From there, you can add more lights as you go if you decide you want to show off more of your home. Looking to build onto your basic light display? If you’ve got a front porch, it’s the perfect place to start. 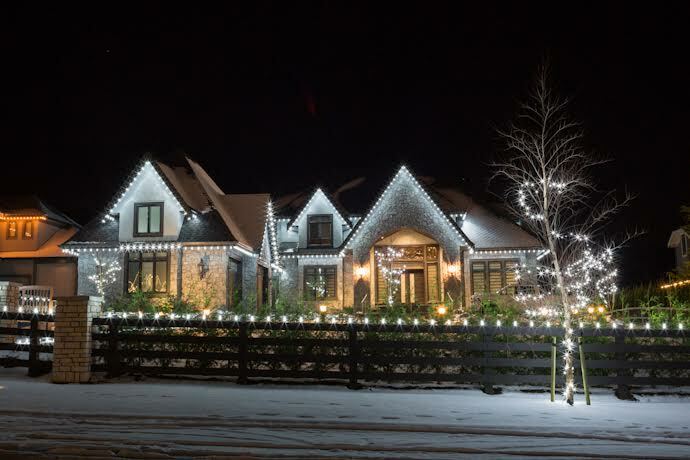 Highlight it by stringing lights around the edges of the roof, along the railings, and around the front door. If you have any particular elements of your house or yard that you want to highlight, consider using different colored lights for certain pieces. For example, you could use all white lights on your house, and multi-colored lights along a fence or on shrubbery. This creates some contrast and draws the eye to each individual element. Trees look incredibly beautiful when they’re all lit up, no matter what size and type you might have in your yard. There are a couple of different ways to do it, and you can adapt these ideas to several different types of trees. For a more simple look, you can just string lights through the branches. However, if you really want to show them off, try wrapping the trees with multiple light strands. To do this, you’ll need to wrap the strand of lights around the base of the tree, and continue up, wrapping larger branches. Once your tree is wrapped, you can string additional lights through the upper branches for a truly magical design that will make your house truly stand out. If you’ve ever seen National Lampoon’s Christmas Vacation, then you know what it means to go full Griswold. (Of course, your version won’t cause a large scale power outage!) If you’re ready to go beyond the outlines, it’s time to invest in more strands of lights. Anything is possible—if bigger is better in your world, you can incorporate pretty much all the ideas we’ve mentioned above. You can cover every inch of the front of your house in lights, and even extend them into your yard, winding around bushes and trees. It’s like turning your home into a real-life gingerbread house!